Doppler RADAR is a RADAR which is used to produce velocity data about objects at a distance by using the Doppler Effect. Doppler RADAR emits microwave signal and analyses the returned signal and how the desired target object's motion has altered the frequency. Globally, technological advancements, rise in the demand for economic and security issues, and growing defence budgets of different countries are the prime growth drivers of global Doppler RADAR market. In addition, territorial conflicts and geopolitical instabilities in Middle East and Asia-Pacific region, and growing military spending, and aviation industry in emerging economies such as China, India and others will create new opportunities for global Doppler RADAR market. However, high cost of space-based RADARS, and adverse climate conditions are the key restraints for global Doppler RADAR market. This report identifies the global Doppler RADAR market size in for the year 2014-2016, and forecast of the same for year 2021. It also highlights the potential growth opportunities in the coming years, while also reviewing the market drivers, restraints, growth indicators, challenges, market dynamics, competitive landscape, and other key aspects with respect to global Doppler RADAR market. Geographically North America dominated global Doppler RADAR market, and Asia Pacific is projected to have fastest growth, owing to rapidly increasing defence spending and boost in aviation industry in this region. 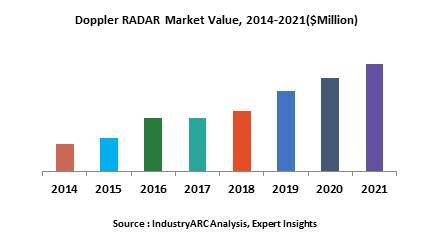 Among all the end-users, military and defence segment has the highest market share in global Doppler RADAR market.